Another name for Edward was Edmund ALSTON LORD OF SAYHAM. EDWARD ALSTON was Lord of Sayham, Sayme, or Siam Hall, as it is now called, in Newton, near Sudbury, in the Hundred of Babergh, Co. Suffolk. The eldest son of William Alston of Newton, Edward became on his father's death the head of the family, and by the death of his brothers William and Robert, without issue ?, the sole continuator of the main stock.
. . . . . It seems the Lordship passed down peacefully with the descendants off Ralph de Limesi as tenant in chief, the next date is abt 1550 when it was bought by Edward Alston son of William Alston of Newton Hall and grandson of John Alston of Newton . . . . . ". The Manor was held of the King as of His Honour of Clare by Knight's Service, it was destroyed by fire in 1959 whilst undergoing repairs. EDWARD ALSTON'S WILL; was dated 10 Jan 1592 (34 Eliz), proved PCC 6 May 1593 and runs to many pages below. Lionel Cresswell in Alstoniana, himself a Solicitor wryly comments "Alston Wills as a rule exhibit much of the redundancy of verbage that delighted the hearts and filled the pockets of attorneys of past ages". It begins "I bequethe my Sowle vnto Almighty God whoe hath created redemed and sanctified me and All his electe people, hoping faithfully and most assuredly to be saved in the daye of the generall resurrection and judgement by the onely merittes and passion of our Lord and Savyor Jesus Christ"
It recites the antenuptial settlement of a rent charge out of the Manor of Sayham Hall on his wife Christian and desirs his heir, William to pay it puctually. Sayme Hall is left to his heir William. It mentions his ownership of the Crown Inn, a fine old fashioned hostelry in Sudbury, which, renamed the Rose and Crown remained in the family until 1898, when the Alston owners sold it to the Landlord (for L7000 see Pg 379 Alstoniana). This "with all the seelinges, portalles, wainscottes, glasse, settelles, benches, and shelves" he left to his younger son Thomas. To a favoured servant one, William Cockerell of Newton, he gives "six busshells of rye or mislyn (mixture of rye and oats) of the measure commonly called sudburye measure". He is provident as to his transactions in grain, orderng his executors to complete any sales or gifts of corn he may have bargained for or promised. To the poor in many surrounding villages, he bequeathed money and grain. Finally he appoints his younger son, Thomas, sole executor, trusting that he will see his Will truly and faithfully performed according to his special trust and confidence in him, and makes him residuary devisee. Among the witnesses to the Will are Edmond Waldegrave, a member probably of the now noble, but at that time knightly family settled in the district; and Thomas Gosse with whose family there existed cross alliances by the marriages of John Gosse to Elizabeth Alston and Thomas Alston to Susan Gosse. On the death of the patriarch Edward Alston the family was divided, his two sons becoming the progenitors of branches co-equal in affluence and eventually of rank. It will be observed that Edward was the last ancestor in common of the baronetical families of Odell and Chelsea. In the name of God amen The tenthe daye of Januarye in the foure and thirteth yeare of the Reigne of our Soveraigne Lady Elizabeth by the grace of god Quene of Englande Fraunce and Ireland Defendor of the faithe etc. I Edwarde Alstone of Newton in the County of Suff, and within the Dioces of Norwiche yeoman being of perfecte healthe and good remembraunce the praise be given vnto god therefore and revoking and renouncing all other Willes and testeaments by me at any time made before the daye of the date hereof doe nowe make and ordayne this present wrighting conteyning and declaring therein and thereby my true Testament and Last Will in suche manner and forme as is herevner specified (that is to saye) ffirst and principally I bequeathe my Sowle vnto Almighty god whoe hath created redemed and sanctified me and all His electe people hoping faithfully and most assuredly to be saved in the daye of the generall Resurrection and judgement by the onely merittes and passion of our Lord and Savyor Jesus Christ And I will by bodye to be buryed in Christian Buriall in Newton aforesaid by the good discreacon of my Executor herevnder named. Item whereas I the saide Edward by my Deede of graunte made before the mariage had and solemnized betwene me and Christian Nowe my Wyfe have given and graunted vnto her the same Christian and her assignes one Annuitye or Rent charge of ffive poundes to be pceived and taked yearely owte of my Mannor of Sayham Hall in the saide County of Suff. for and in Recompence and full satisfcation of all her dower and Righte and title of Dower whiche she oughte to have or may Lawfully clayme of in or to the same Mannor and all other my Landes Tenements and Hereditaments with theire appurtennces my minde and will is and I doe ordayne devise and appointe that William Alstone my oldest sonne his heires and assignes shall yearely well and truly content and pay the same Annuitye or Rent charge vnto her the said Christian my wyfe and her assignes during her naturall lyfe out of for and in respecte of the Scite and Landes of the same Mannor whiche shall descend or be otherwayes given or devised vnto him by this my will according to the effecte of my said deede and my true entent and meaning therein and hereby declared. Item I give and bequeathe vnto Thomas Alstone my youngest sonne and to his heires and assignes for every all that my parcell of Land conteyning in Lengthe thirty foote and in breadthe twenty foote be it more or Lesse some time being parcell of a Crofte called Marche Crofte in Newton aforesaide with the Cottage therevppon now standing and builte And all my Revercon Remainder Righte title and interest whiche I nowe have or oughte to have of in or to the same Lande and Cottage and every of them as they bene now in the tenure or occupacon of one Emme Harkwoode widowe. Item I give and bequeathe vnto the same Thomas my sonne his heires and assignes for every all that my parcell of Lande and pasture conteyning by estimacon halfe an acre be it more or Lesse nowe or Late being parcell of my Tenement called Burchettes as the same peece nowe lyeth enclosed from the residue of the same Tenement into a greater feild neere vnto the Cheife Mansion howse wherein I nowe dwell in Newton aforesaid. Item I give and bequeathe vnto the said Thomas Alstone my sonne his heires executors and administrators all and all manner of seelinges portalles wainscottes glasse settelles benches and shelfes scituate standing or being in or abowte the saide Mancon howse wherein I nowe dwell in Newton aforesaide and in the abowte the Messuage of Inne called the Crowne and other the Messuages in Sudburye in the saide County of Suff nowe or late in the severall tenures or occupacons of Thomas Foxe and John Godfrye or either of them And moreon my Will minde and true intent is that the saide Thomas Alstone my sonne his heires and assignes shall and maye from henceforthe for every peaceably and quyetly and withowte any expulcon eviction Lett or disturbaunce of the saide William Alstone my eldest sonne his heires and assignes or any of them have holde and enioye all and sinuler those messuages howses buildings yardes gardens orchardes Landes tentes meadowes pastures feeinges woodes groves marshes Rentes Reversion services tithes tenthes wayes Libertyes easements proffittes comodityes and hereditamentes whatsover with all and every theire appurtennces scituate Lying or being in the Counties of Suff. and Essex or in any of them which bene conteyned or expressed in all and singuler my deedes ffeoffamentes grauntes Conveyaunces and other writinges vnder my hande and seale vnto him the same Thomas by me thereof made and delivered before the date or time of the making of theis presentes according to the purporte and effecte of the same severall deedes ffeoffamentes conveyaunces and wrightinges And my true intent and meaning in them and herein declared. Item I give and bequeathe vnto the saide William Alstone my sonne my Closse of Lande called or knowne by the name of Startoppes with the appurtennces scituate and being in Boxforde in the said County of Suff. to have and to holde the same vnto the saide William my sonne his heires and assignes for evervnder the Condicon and with such limitacon and in suche manner and forem as is herevnder expressed and declaired that is to saye that by the same William my sonne his heires executors or assignes or some or one of them shall well and truly content and paye or cause to contented and paied according vnto this my Last will vnto ffoure of the Children of the same Thomas Alstone my sonne borne of the bodye of his first wyfe the Some of three score poundes of Lawfull money of England in manner and forme following that is to sayevnto Alice Alstone one of the saide Children thirty pounds thereof To Thomas Alstone the yonger one other of the same Children Tenne poundes thereof To Edward Alstone one other of the same children Tenne poundes thereof And vnto Elizabeth Alstone the fourthe of the same Children Tenne poundes residue of the saide three score poundes to be paide vnto every of them severally at this and her severall age of Eightene yeares. And if it shall happen any of the saide fowre Children to dye or departe this Lyfe before his or her said age of Eightene yeares then my Will and minde is that the part and porcon of the saide three score poundes to such of the same Children so dying bequeathed shall remayne and be paide given diveded to the amongest so many of my saide sonne Thomas his said fowre Children as shall Live and attayne vnto his or her saide age of eightene years viz. : vnto every one of them parte and parte a lyke at theire severall ages aforesaide And if the said Willm my sonne his heires Executors and Aministrators shall make defaulte to paye vnto the saide children or to any of them his her or theire parte or porcon of the saide money vnto them in forme aforesaide bequeathed or any parte thereof And also shall vppon any Reasonable request or requestes to any of them after to be made by any suche Childe or Children whoe shoulde or oughte to have the same in forme aforesaide denye or refuse or doe neglecte to paye the same within fourtene dayes next after any such requests made That then and from thenceforthe all the wholle estate righte vse and interest of the same Wiliam Alstone my sonne his heires and assignes of in and vnto the saide Closse of Lande called Startoppes with thappurtennces together with all and every gifte bequest devyse discent and title thereof vnto the same William his heires and assignes or any of them devised bequeathed Limited made descending or coming shall ceaseand determyn and shall thenceforthe be vtterly voide and of no force nor effects any Cluase sentence or article in this my Will conteyned or any other acte or thing to the contrary thereof on any Wise notwithstanding And my Will and mindis that they then ymediatly from and after any such defaulte and denyall refusall or neglecting of payment of the saide money or any parte thereof to the saide children of any of them whoe oughte to have the same in forme aforesaide first happening the saide Closse of Lande called Startopps with the appurtennces shall wholly remaine and be vnto the saide Thomas Alstone my sonne his heires and assignes for ever vppon and under the Lyke condicon That he the same Thomas my sonne his heires executors administrators ar assinges shall well and truly content and paye or cause to be contented and paide the Lykje some of three score poundes, to and emongst the saide ffowre Children borne of the bodye of his saide first wyfe or to or emongst so many of them as shall attayne or come vnto the saide age of Eightene yeares in suche manner and forme as is above specified and at suche time or times as they or any of them shall reasonablye requyre or demaunde the same after the attaynement vnto his or her age aforesaide. And I will and bequeathe the Scyte of my Mannor of Seyham Hall and all the howses buyldings Landes Tenements meadowes pastures ffeedings Woodes vnderwoodes groves Rentes Revercons Services Comons wastes Tenthes and tithes herbages porcons of tythes and hereditamentes nowe being any parte member or parcell of the saide Mannor or nowe incident or belonging vnto the same Mannor Excepte all and every suche parte parcell and porcon of them and of every of them and all and every suche Rent charge and proffit vssuing and going owte of the Mannor as bene otherwise given willed or bequeathed by this my will to any other person or persons or whereof I have heretofore amde and delivered any ffeoffament deede or any other Writing or conveyaunce vnto the saide Thomas Alstone my sonne or vnto the aforesaide Christian my Wyfe or to any other person or persons to any other vse or vses vnto the saide William Alstone my sonne his heires and assignes to his and theire owne vse and vses for ever for and as a full third parte and more of all and singular my Landes Tenementes and Hereditamentes whatsoever. And for a full satesfacvtion and recompnce of all manner of Landes Tenementes Rentes thirde partes Rightes and demaundes whiche he the same William my sonne and his heires or any of them shall maye or oughte to clayme have or demaunde by from and after my Decease by reasonb of any tenure by knighte service tenure in Capite or for or by reason of any other cause matter or means whatesoever Provided neverthelesse and I will and ordayne that if the aforesaid William Alstone my sonne his heirs and assignes or any of them of any other person or persons by any of theire comaudements consentes or agreementes shall at any time or times hereafter for or by reason of any tenure by knightes service tenure in Capite or for any other cause or matter make any actuall entrye into the landes tenementes and hereditamentes which bene by my will or by any other Deede ffeoffament conveyance or Wrightin my me made and signed with my seale given willed devised conveyed or graunted vnto the saide Thomas Alstone my sonne or into any parte or parcell of the same with any intent or purpose to frustrate or make moide any parte of my saide will of any gifte graunte devise estate or matter conteyned ordayned made of Limited in or by my saide will or in or by any such deede ffeoffament conveyaunce or wrighting by me made and signed as is aforesaide or shall sue to have or recover from the same Thomas my sonne or any any of his heires or assignes any parte of the same landes tenementes or hereditamentes so given Willed devised conveyed or graunted vnto the saide Thomas my sonne contrary to the porporte or effecte of my saide will or of any such deede ffeoffament conveyaunce or writing by me thereod made as is aforesaide or contrary to my minde will or ture intent of or in the same my Will deede ffeoffament conveyance or writing or in any of them expressed and declared or shal make doe commit or comaunde or procure to be donne or made any other acte or actes thinge or thinges whatesoever whereby the saide Landes Tenementes Rentes Revercons and Herditamentes or any of them or any parte or parcell of any of them by my saide Will dees ffeoffaments conveyances and writings or by any ot them given devised willed or graunted vnto the aide Thomas my sonne and his heires or vnto the saide Christian my Wyfe or to any of them shall not or maye not remayne conteyne or be had and enjoyed by the same Thomas his heires and assigns and by the saide Christian and her assignes or by any of them in suche amnner and formne as they bene herin or in or by my saide Deedes ffeoffamentes conveyances and writings or any of them given graunted Limited devised or appointed or if the same William my sonne his heires or assignes or any of them shall refuse or denye or doe not within three moneths next after that he or they sjalbe therevnto reasonably requyred by the saide Thomas Alstone my sonne his heires or assigns Lawfully clearely suffiently and perfectly convey and assure or cause to be conveyed and assured vnto the same Thomas hes heires and assignes all and singuler the saide Landes Rentes Tenthes tithes and Herditamentes with the appurtennces vnto him the saide Thomas by my saide will Deedes ffeoffamentes conveyaunces and writings or any of them given graunted assigned Limited or devised or menconed to be given graunted or devised according to the purporte and effects of my saide will deedes ffeoffamentes conveyances and rwitings and of every or any of them or contrary to my true intent and meaning in any of them expressed or delcared or any estate right interest possession Reversion vse condicon clayme or Deamunde of in or vnyo the same Landes tenementes and herditamentes or any parte or parcell thereof whiche shall or mat Descend accrewe or come vnto him the same Willm his heires and assigns or any of them by or after my death by shuche good suffient Lawfull and reasonalbe release and releases confimatacon Deede or Deedes enrolled ffyne or ffynes ffeoffamentes Recoveryes or other good reasonalbe and sufficient assurances and conveyances whatsoever with warrantye or warantyes thereof against him the same William his heires and assignes as shalbe in that behele devised or advised and required by and at the Costes and charges in the Lawe onely of the same Thomas his heires or assignes or some or one of them who shall have or shoulde or oughte to have any estate titles interest Reversion or vse of in or to the same Landes tenementes and herditamentes or any of them by force or vertue of my saide will or Deedes ffeoffamntes conveyances and writings or any of them accoroding to my ranuntes minde purpose and true intent in them or any of them expressed and delcared That then imediatley from and after suche entrye sute recovery deniall acte thinge or defaulte as is aforesaide first had made Donne comitted or procured by the said William my sonne his heires or assignes or any of them and from thenceforth at all times after the wholle estate righte title and interest of the same William my sonne his heaires and assignes of in and to all and every parte and parcell at the saide Mannor of Sayham Hall with the apputennces given bequeathed Limited declared or intended to come Descend remayne or be vnto him the same William Alstone his heires and assigns or any of them by this my Will or otherwise shall cease and be clearely frustrate and voide to all intentes constructions and purposes And I will and bequeathe and my full minde and true intent is that all and singuler the same parte parcell and porcon of my saide Mannor of Sayham Hall and of all Landes tenementes Tithes tenthes and herditamentes of the same Mannor by this my Will given devised bequeathed or Lymited or declared or intended to Descende come remaine or be vnto the saide William my sonne his heires and assignes as aforesaide shall then imediately and from thenceforthe at all times after wholly be and remaine vnto the saide Thomas Alstone my sonne his heires and assignes during and vntill suche time as the saide William my sonne his heires or assignes at his theire owne proper Costes and charges shall have Lawfully clearely and sufficiently conveyed ans assured vnto the saide Thomas Alstone my sonne his heaires and assignes all and singuler the aforesaide Landes tenementes and Herditamentes with theire appurtennces which bene vnto him the saide Thomas in and by my saide Will Deedes ffeoffamentes conveyaunces and Writings sealed or any of them Willed devised given graunted or intended according to the estate or estates and interestes And my true mind and intent thereof Limited declared or expressed in my saide will Deedes and writings sealed and in every or any of them discharged of and from all and singuler other rightes titles estates uses chargescondicons Demaundes and encumbraunces whatesoever before that time had made Donne or procured by him the same William my sonne his heires or assigns or any of them or by any of theire consentees meanes or Comaundementes And when and as soone as the saide Thomas Alstone my sonne his heires and assignes shall have all and singler the saide other Landes tenementes and hereditamentes with the appurtennces by this my Will and by my saide Deedes or other Writings afroesaide and every of them devised willed conveyed or graunted clearely perfectly ans suffiently conveyed and assured vnto the same Thomas Alstone my sonne his heires and assignes according to the Limitacons effectes amd my true intent and meaning thereof in my saide Will and other my saide severall Deedes and writings thereof expressed and declared. Then I will and my minde and true intent is that the saide estate and interest of the saide Thomas my sonne his heires and assignes of inb and to all and singuler that partes parcell and porcons of my saide Mannor of Sayham Hall and of all and singler the aforesaide Landes tenements rentes services tithes and hereditamentes to the same Mannor apperteyning and belonging which bene before by the expresse wordes of this my will or my true meaning herein expressed Willed devised Limited or Lefte to Descend vnto the saide William my sonne and his heires shall then cease and be from thenceforthe frustrate and vtterly voide and of none effecte And that then and from thenceforthe and at all times after all and singular the same parte partes parcells and porcons of the same Mannor Landes trenements tithes and hereditamentes of the saide William my sonne and his heires so as is aforesaide Willed devised Limited or Lefte to cescend by or according to the saide former expresse wordes of this my Will and the true intent thereof shall all wholly remaine and be againe vnto him the saide William my sonne his heires and assignes for ever according to the effecte Limitacon and my true minde and intent thereof in and by my saide Wordes of and this my Will first above expressed Devised and Declared and not otherwise nor in any other manner nor forme And all Residue of all and singuler my Landes Tenementes meadowes pastures feedinges Woodes vnderwoodes Rentes Revercons tithes and hereditamentes whatesoever scituate Lying or being in the Countyes of Essex and Suff. or in either of them with all and singuler theire appurtennces whiche be not otherwise by me willed devised Limited or dispoed vnto the saide William Alstone my sonne his heires by the expresse wordes of this my testament and Last will and my full mide and intent in them expressed and declared I give and bequeathe them all vnto the aforesaide Thomas Alstone my sonne his heires and assignes to the onely vse and behoofe of him the same Thomas his heires and assignes for ever. Item I give and bequeathe vnto Alice King my daughter fforty shillings of Lawfull money of England And vnto Elizabeth Skott the daughter of the same Alice I doe give ffive shillings of Lyke Lawfull money to be paide vnto either of them by my Executors within one moneth next after my decease. Item I give and bequeathe vnto William Cockrell of Newton sometimes my servaunte Six bushelles of Rye of Mislyn of the measure comonly called Sudburye measure to be delivered vnto him within halfe a yeare next after my decease. Item I give and bequeathe vnyo every one of my seruntes dwelling with me whiche shall have served me one wholle yeare next before my Decease one seame of barlye of the same measure to be delivered vnto every of them one yeare next after my decease. Item I give and bequeathe to and emongst poor people dwelling in the saide County of Sufk. Twenty Busshells of rye or mystlin to be distributed emongs them where most neede shall requyre by the good diecreacon of my Executors within one yeare next after my decease. Item I give and bequeathe vnto the poore people of the parrishe of Edwardstone Twenty shillings of Lyke Lawfull money. To the poore people of the parrishe of St. Peter in Sudbury Twenty shillings of Lyke Lawfull money. To the poore people of the parrishe of St. Gregoryes in Sudbury Twenty shillings of Lyke Lawfull money. To the poore people of the parrishe of Assington Tenne shillings of the Lyke Lawfull money. To the poore people of the parrishe of Bosforde Tenne shillings of the lyke lawfull money. To the porre people of the parrishe of great Waldingfeild Tenne shillings of the Lyke Lawfull money. And to the poore people of the parrishe of Littel Waldngfeild Tenne shillings of the Lyke Lawfull money. All whiche saide Legacies of money bequeathed to poore people as id aforesaide my Will and minde is that they shalbe paide by my Executors within one moneth next after my decease. Item I will and my minde is that all and every suche person and persons as I have souled or shall sell any Corne vnto by my Executors during my Lyfe shall have the same well and truly paide and delivered vnto them by my Executors according to the forme and effecte of theire severall bargaines thereof made. And also my Will and minde is that all my saide bargaines of Corne and ll my Legacies of Corne in and by this my Testament and Last Will given or bequeathed together with all suche other Corne as shalbe necessarily spent abowte the Execucon of my ffuneralls and every of them shalbe all borne paide and discharged by my Executors of ans with suche Corne as I shall have in my howses barnes and sallers at the time of my decease. And for defaulte of suffient Corne there to be had to performe the same That then the residue thereof vnformed shalbe supplyed and borne with such other Corne as I shall have growing on my groundes at the same time of my decease. And of this my saide Last Will and Testament I doe ordayne make constiture and appointe the aforesaide Thomas Alstone my youngest sonne to be my true sole and onely executor trusting that he will see the same my Will truly and faithfully performed according vnto my special trust and confidence in him reposed in that behalfe. And ffinally my will and minde is that my saide Executor shall have and take all my plate Jewells and ready money and all the debtes which bene owing vnto me by any person or persons all and singuler my billes of debts obligacons and writings obligatory and all other my goodes chattelles howsehold stuff Implementes and moveables whatsoever whiche be not oherwise by me expressly before given or bequeathed by this my Will for and toweardes the payment of my debtes which I doe unto others and the payment and satisfaction of my Legacies And for and towardes the execucon and due performance of this my saide Last Will and Testament And my saide Legacies and Debtes being truly and fully satisfied and my saide Will being fully and truly performed and fulfilled there with in every pointe and respect I doe give and bequeathe all the whole overplus and Remaynaunte of all and every of them vnto my saide Executor to his owne onely and proper vse for ever. In witness whereof I have sett and subscribed my name to theis presentes And to the Last leafe thereof I have sett my seale the daye and yeare first above written. Readd sealed subscribed and published in the presence of vs the witnesses herevnder named Edmond Waldegrave per me Johem Skynner Per me Thomam Gosse Per me Richum Skynner Per me Johem Thommam Alston Junr. Proved in the Prorogative Court of Canterbury before William Lewyn, Doctor of Laws, by Thomas Alston, Executor on 26th May 1593. Page 89 Alstoniana, copy of Will on this File. EDWARD ALSTON, Newton, Suffolk, yeoman. Will 10 January 1591/2 ; proved 26 May 1593. To be buried in Newton. Eldest sonne Williain Alston to pay to my now wife Christian rent charge of £5 out of my manner of Snyliam Hall as by marriage settlement in place of dower. To youngest sonne Thomas Alston parcell of Marche Crofte, Cottage occupied by Emme Harkewood widowe my mansion House Burchetts and other lands in Newton, owners of "Burchetts" to pay 10s yearly to poore for ever. To sonne Thomas also Inne called the "Crowne" and other messunges in Sudburye in tenure sof Thomas Foxe and John Godfrye, and Thomas, to have unmolested by William all lands in Suffolk and Essex conveyed to him. For sd son William Alstone ''Startoppes" close in Boxforde Suffolk, paying to four of children of sonne Thomas Alstone borne of bodye of his first wyfe £60 viz Alice Alstone £20, and Thomas, Edward, and Elizabeth Alstone £10 each paid at 18 years of age etc. etc. etc. etc. To sonne Thomas Alstone residue of lands not limited to sonne William. To my daughter Alice Kinge 40s and to her Daughter Elizabeth Skott 5s. To some time servante William Cockerell 6 busshelles of rye or myslyn of measure commonly called Sudburye measure To servants a seame of barlye ditto. To poore of County of Suffolk 20 Busshells of rye or mystlyn To poore of Newton Edwardstone, St Peter in Sudburye, St Gregoryes Sudburye 20s each and Assington, greate Horkesley, Boxforde, greate Waldingfeild and Little waldingfeild 10s each. Executor: youngest sonne Thomas Alstone. All plate jewels debts and residue of estate to executor. Witnesses : Edmond Waldegrave, John Skynner, Thomas Gosse, Richard Skynner, Thomas Alstone Jnr. Edward must have married speedily on the death of his second wife Elizabeth. Visitation of Essex 1552- Harleian Soc. 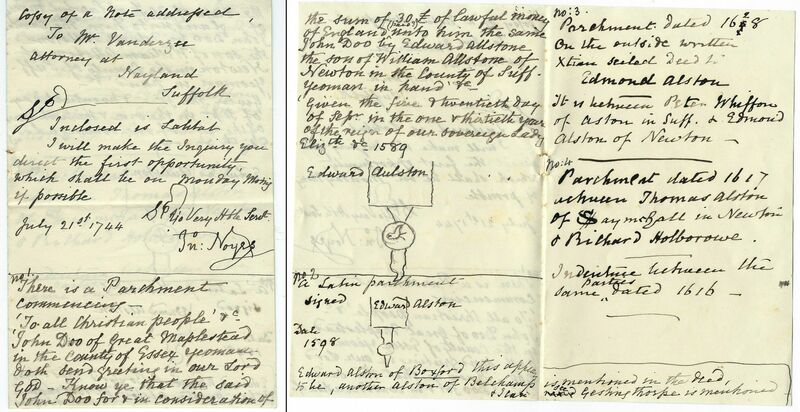 mentions Edward & Elizabeth Alston of Newton 1634. In the 20th C the Lowry-Corry family of Edwardstone Hall owned Siam Hall & Rogers. A marriage between an Edward Alston and a Margarette Fleming at Edwardstone 1586 is unsourced. 1. Siam Hall: The Ancestoral Seat of the Alston's of Suffolk. 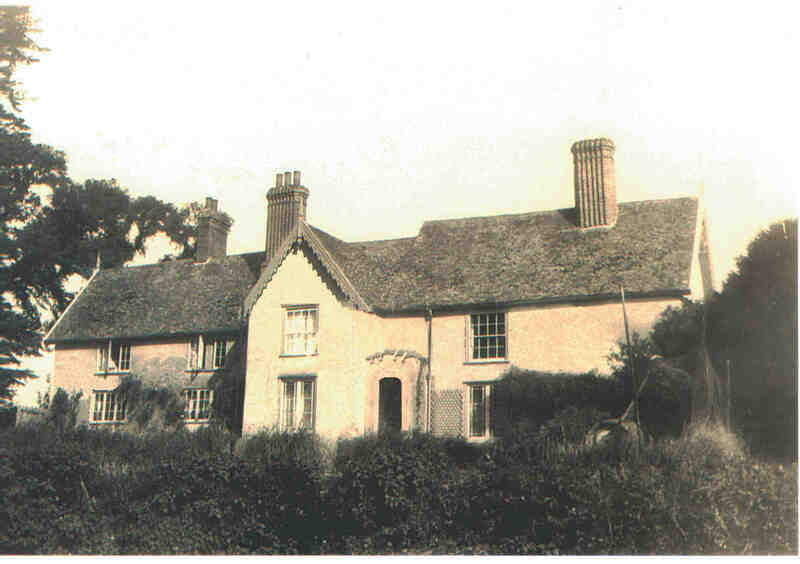 A 19thC image of the house, 1938 visit by family, after the fire in 1959, the old barn. 2. Loan by Edward Alston to John Doo of £30, 20 Sep 1589, Nayland SFK.